did you know there are farms that allow you to pick your own flowers? i sure didn’t. i’m constantly looking for new and fun activities to do with penny and i found out about a flower picking farm in south windsor, ct from a mom’s group in my town. recently, i joined a mom’s group; i discovered this group through our town library and, not long ago, i saw the group on my instagram newsfeed. for an annual fee of $25/year, moms and their children participate in weekly activities, organized and spontaneous playgroups, monthly moms’ night out, and participate in board meetings. it’s always great to meet other moms and provide our children more opportunities to socialize with other kids. the first activity i attended via the mom’s group was a music & dance playgroup at a local nursing & rehabilitation center. the children participate in organized activities during the hour-long playgroup and can interact with the residents if they choose. penny was shy at first because of all the people but she loosened up when she saw that the children were playing with big balloons. i thought that was a wonderful way to keep the kids preoccupied while waiting for the program to begin. some of the residents asked penny to hit the balloon to them so they could hit it back to her. it was really sweet to see how much joy the children brought to these people. this playgroup consisted of a sing-along, interactive reading, musical instruments, bubbles, parachute, and a snack. penny was engaged the entire time and was excited to move on to the next activity. although she really enjoyed everything, i could tell penny was particularly pleased with the cup of juice at snack time. we rarely let penny drink juice so it was a real treat for her especially since she was thirsty from all of the activity. overall, i was really pleased with the whole event and can’t wait to go back next week. tuesday morning, the mom’s group went to petersen farm in south windsor to pick our own flowers. visitors can park right on the grass. the farm provides cutting tools, buckets, and water although it’s recommended you bring your own bucket to safely transport the flowers back home. flowers are $8/lb (which is an excellent deal) and i initially scoffed at the price thinking, “who gets a pound of flowers?” well, i ended up getting two. the flowers are all so gorgeous that you can’t help but want each one. i might have gotten a little scissor-happy. the only downside is that it was misting when we went so the grass was wet, soaking our sneakers. i had been thinking about purchasing rain boots for penny and now i have more of a reason to do that. fall is around the corner and they’ll be useful then, too. we both enjoyed ourselves and i look forward to going back. fresh flowers certainly brighten up a room (and a mood!) and also smell divine. tuesday was also “national custard day” so rita’s was having a .99 special for a kid’s size custard. i intended to meet some moms from the group around 3:30 but we didn’t end up arriving until after 4pm. i had to wake penny up from her nap because she was sleeping so much. ezra’s naps were off today because he’s been rolling over. since he was awake, we all went to rita’s. as for upcoming events and activities, there is a tolland 4-h fair this weekend so i’m thinking of bringing both kids to that. two kids: two years old & two months old. people usually have their children close in age to one another so that they can be friends. they also have multiple children with the notion that it will be fun. but… when does the fun begin? okay, i guess i’m being dramatic but it sure is hard when your little ones are… just that, little. raising two kids is slowly becoming more enjoyable as dennis and i have gotten into the groove by tag-teaming and implementing consistent yet still flexible schedules. ezra is still too young to have a set schedule like penny’s but, like i’ve said countless times before, it’s never too early to start. i already see a big difference in his daily routine because i follow the eat/play/sleep schedule and feed him enough calories during the day to have longer night sleep. like penny, we incorporate bath time into ezra’s nightly bedtime routine. they both love water so being immersed in its warmth helps them relax (although penny is as energetic as ever) as well as signal to them that bedtime is near. ezra has been consistent with doing a good 5~5.5 hour stretch of sleep before waking up again to feed. then, he will usually sleep for another 4~5 hours. he has been going to bed between 8~9pm lately. two nights ago, he slept for 7.5 hours straight! most babies his age have a later “bedtime” of closer to 10 or even 11pm. we like putting him down earlier so we can have time to ourselves and also so that we don’t have to gradually push his bedtime to what it is now later on when he’s older. plus, his evening naps aren’t so great so by that time he’s overtired and ready to pass out. penny usually takes a bath around 7pm (6:30 if her nap ended earlier) so ezra usually takes a bath around then or a half hour later. it’s just easier to get both kids down at the same time – i normally do penny’s bedtime routine while dennis does ezra’s. then we will briefly gather to give the kids a chance to say good night to another (and us) and give kisses. because of the two year sleep regression, penny’s been fighting her nap and bedtime. she will eventually fall asleep for her nap but sometimes she will play for an hour! this results in a late bedtime, sometimes close to 9pm! i religiously refer to babysleepsite.com for advice and it says to keep up with the daily bedtime routine – don’t change the times or drop the nap because this, too, shall pass. it really is obvious that penny is exhausted.. even with her falling asleep so late at night, she will wake up a few times during the night and have an early wake-up. last night she fell asleep close to 9pm and woke up this morning at 6:30am! you bet she was a hot mess around 11am! she passed out almost right away during her 12:30pm naptime. now that penny’s 100% better, her appetite has returned somewhat. she did have 3 canines break through around the same time so they, along with her illness, most likely affected her eating habits. i find myself being much more patient and tolerant around penny now. this may be because her behavior has markedly improved – again, now that her teeth broke through. there are times where she can still be clingy, whiny, and disagreeable but there are much less instances now, and that’s typical toddler behavior anyway. she has so much charm that it’s difficult to stay upset at her for long. my mil even laughs and says, “how can you stay mad when she acts so cute?” it’s so true.. but it’s so bad because i feel like we enable her naughty behavior if we laugh. i still try my hardest to be firm with her and have consequences for her poor choices. she knows how to pose! i used the glink for the first time – what an amazing double stroller!! can’t say enough good things about it! this week, i started working on getting back in shape. i didn’t exercise once during my pregnancy besides taking walks so attempting to go for a jog on monday night was torturous. my legs felt like lead and my lungs were straining to take in air. i kept at it however by doing a brisk pace/jog combo and eventually built up a bit of endurance. last night i ran ten laps on the indoor track at the gym. since i arrived around 9:15pm, there was only one other person at the track and he was shooting hoops. excuse my little outburst there.. there’s always so much to do and so little time. ezra’s 100th day is quickly approaching so i need to start planning for that! he officially is 100 days old on july 20th so we chose the 22nd as the celebration date. now we need to work on the guest list and food. and.. a happy 27th (!) birthday s/o to my not-so-little brother, james. he’s living in cali now so i can’t see him but some of his friends flew out to celebrate with him. have a blast! there have been many things to celebrate recently – two weddings and a first birthday party. although both weddings occurred in october i haven’t had the time nor energy (mostly energy) to organize and edit photos for a blog post. the so family leaves for maryland tomorrow for a family vacation and that’ll be another post in itself when we return; so if i don’t post the wedding and birthday pictures i’ll never get around to them. on october 15, we attended our friends’, alice and john’s, wedding. dennis was the best man and penny was the flower girl. we were nervous about penny walking down the aisle since she still is so young. i brought her lovey and lots of snacks to help coax her down the aisle, but in the end all it took was one cracker. i did try having her walk down by herself but she was understandably nervous with everyone’s eyes on her. in hindsight i wish i had walked ahead of her so i wasn’t in any of the photos. but we are just relieved she didn’t cry or run away. what’s a wedding without some photobooth fun? penny also only attended the ceremony. my mil took her back for her nap and dennis and i moved on to the reception. we were able to enjoy ourselves more not having to chase penny around, keep her entertained, and trying to feed her at the table. eternally grateful to have dennis’ parents nearby. the next wedding was for esther and tony on october 29. they are our friends from church so john was in attendance too (two weeks after his own wedding!) but alice had to work. interestingly enough, both weddings we attended were morning weddings. i’m fairly certain i have never been to a morning wedding before. the best part about a morning wedding is you still have time to relax when you get home. in both cases actually dennis and i ended up passing out earlier than usual. it was lovely having an excuse to get dressed up and go out. dennis and i had been long overdue for a night out so those two weddings were a great way for us to enjoy time with friends without worrying about a baby. although we had fun, we were so tired that we just looked forward to going home! many of my friends had babies in 2015 so there were a lot of first birthday parties this year. i attended the final one for this year this past sunday in massachusetts. thankfully, my mil was able to watch penny and i made the 1.5 hour drive each way to celebrate bowdin’s first year of life. min MADE these forever cacti favors..
such a good idea to use pearls! the birthday party was fun and it was so cute to see all the of the special details my friend, min, put into it. best of all, it’s over! it’s always a relief when the first birthday is done and over with… all those months of planning..
min lives in maine so i rarely see her. the last time i saw her was at penny’s first birthday back in may. i hope someday we can make it work where our little girls can play while the mommies catch up. someday soon. d-18 until penny’s party! i think it’s safe to say that the majority of 2016 was spent agonizing over the details of penny’s first birthday. for the most part, i’ve completed the dol towers – all 3 of them – but i still need to do the tops. i need a break from those for now, and there are other pressing matters that i need to attend to. for instance, this saturday my friend, mouy, and i were going to make a day trip up to boston to drop some decor off at my parents’ house. dennis and i already have so much to bring up (i.e pack and play, stroller, etc.) the day before the party so we wanted to make sure we have enough room in the car. i had to postpone this trip because i realized that my idea for a backdrop isn’t going to work because it’ll be too big to transport even in an suv. so, i was left scrambling for alternative ideas. genie assisted in helping narrow down the options, and saturday will be spent (hopefully) starting and completing the backdrop with the help of two friends! a lot has happened since the last post. penny’s first tooth is finally trying to break through! we can see, and feel, the top of a tooth on her bottom gum. she’s been fussy during the daytime lately but usually during mealtimes. she’d rather play than sit in a high chair… she’s still sleeping very well at night so we haven’t noticed any changes (thank goodness). penny had also outgrown her car seat a while ago but we kept putting off purchasing a convertible seat because we figured she would be okay until her first birthday. but then we noticed her feet were sticking out from the car seat more than they had been, and we read an article that a fellow parent had shared in a parenthood group on facebook about switching to convertible seats sooner rather than later. dennis had taken a picture from the newest edition of the baby bargains book and the britax boulevard clicktight was the best-rated of the bunch, so we went with that. it arrived yesterday and we can tell penny is already much more comfortable in it. we already took her to the pool for a family swim, cheesecake factory for dinner, and to the grocery store. our friends, esther and william, came down from massachusetts with baby olivia (aka ollie) to visit us a few weeks ago. this is olivia k., not olivia g. (genie’s “olivia.” 😀 – a very popular name this year!) it was super sweet of them to make that drive to come see us and we all had a wonderful time. we joked that the boys seemed to enjoy the play date the most but in all seriousness i think they did. they played table tennis, ps4, and basketball while esther and i … played with the babies -_- no, but still, i’m glad dennis had fun because he doesn’t really get to “play” much and i enjoyed my time with esther just having girl talk. dennis’ 31st birthday was on the 17th and he spent the day golfing with his buddies. he ended up being late for a family dinner but he had had a great day, so that’s all that matters. after an enjoyable weekend with friends, dennis and i realized how we need to take more time to take care of ourselves, and have fun too. as much as penny is the light of our lives, we can’t forgot to “treat” ourselves and go out once in a while without her. yes, we’ve been on a few vacations since penny was born but a date night needs to happen more often. being home with penny all day, i sometimes forget how deprived i am of adult interaction. thankfully, my in-laws live nearby so usually they can take care of penny if i have dates with friends. i was able to catch up with two friends that i worked with a few years ago. one recently got married and the other is getting married in july. we went out for happy hour and just laughed and laughed about our teaching experiences.. while also griping about the education system. i guess i’ll make light of it even though it’s a heavy topic but i got laid off recently. connecticut, like all of the other states, has had a major cut in their budgets for schools so teachers are getting laid off and schools are closing. the town that i’m working in laid off 17 teachers (it actually became 15 because 2 resigned) and may even close one elementary school. it’s all by seniority and i missed the cut-off date by two months. truthfully, i was upset (and shocked) and even cried although i had been feeling ambivalent about returning in the fall. it’s more of a pride thing, you know? so many friends, and of course dennis above all, have been sending love and offered encouraging words like how i get to spend even more time with penny. plus, i can always work somewhere else. two teachers have been rehired in the meantime and i’m actually third in line to be called back so there’s a possibility. i fervently believe everything happens for a reason so i’m letting go, and letting God. oh! another important event occurred that weekend: penny’s cake smash! i’ll actually not go into too much detail here because it’ll end up being a l o n g post with a plethora of pictures.. so i’ll save that for the next post, but.. it went well and i’m glad it’s done and over with! i’ll share a few pictures here for those that were not able to view them on facebook. again, i’ll go into specifics in the next post and share how i created a “home studio” and made a giant cupcake. we saved a lot of money this way! my right arm is hovering over the keyboard as i type this entry because the stitches on my wrist prevent me from applying too much pressure on it. on monday night, what was supposed to have been a relaxing and delicious family dinner turned out to be disastrous instead. as dennis grilled 삼겹살, or pork belly, in the sunroom and my in-laws were setting up the dinner table i went to get a small plate out of the cupboard to put the 쌈장, or bean paste spread, on. everything happened so quickly in the next few seconds that i’m not quite sure how it all went down. one minute i’m taking the plate out of the cupboard and then it broke in half – i think i banged it onto the open cupboard door and dropped it causing it to break. as the pieces fell, one half landed on my right wrist and sliced it, nicking an artery. i felt the plate hit my arm but didn’t think much of it until i bent down to pick up the pieces and saw blood gushing from my arm. there was so much blood and i was freaking out! my in-laws saw and rushed over to help and the commotion drew dennis into the kitchen. he quickly applied pressure by wrapping two kitchen towels around my wrist. somehow, penny slept through all this and my in-laws stayed to watch penny and yuri while dennis took me to the er. we were there for a few hours: questioning, cleaning, stitches, and withdrawing more blood. a student was stitching me up while a resident foresaw the procedure. both weren’t wearing masks because it wasn’t clear that i had nicked an artery until the student was about to finish stitching me up and nudged it. i wasn’t looking because i felt squeamish but dennis told me blood squirted up onto the girl’s face and some went in her mouth! blood also sprayed onto the resident’s coat. meanwhile, blood kept pouring out of my wrist and i was worried about losing a lot of blood, but i was told that it was fine because it stopped within a few minutes. thankfully, dennis worked the afternoon shifts the next two days so he took care of penny during the day and his mom came over to help until penny had gone to bed and we had eaten dinner. she even took work off yesterday to help! genie and olivia came over for a playdate – with coffee, doughnuts, and korean food – as well and i enjoyed our time with them. it’s been a busy year already. the trip to dr was a welcome break and then we’ve had overnight visitors (my sister and friend, naomi). plus, my arm injury -_- and also my friend’s daughter’s first birthday party. many of us had babies last year so they’re all turning 1 this year! to top it off, dennis and i have been invited to 8 weddings!! unfortunately, we’ll only be able to make it to about half because many fall on a saturday that dennis works and he’s using up all his vacation days for destination weddings and bachelor party getaways. genie helping us with the bedtime routine! another thing that’s keeping us busy is penny getting ready to crawl. she’s been trying for the past couple of weeks and she’s SO CLOSE. she lifts up her bottom and tries to move but ends up pushing herself backward. sometimes she can get herself into the crawling position while sitting but she’s still trying to figure out how to get one of her legs out of the way. she also practices a lot in the crib because she’s been sleeping on her belly lately for naps and bedtime. she loves to blow raspberries! penny has also been very vocal lately saying, “da da da”, “ba ba ba”, “na na na”, and “ma ma ma.” she also imitates our actions (i.e blowing air –> it comes out like a whistle sometimes). 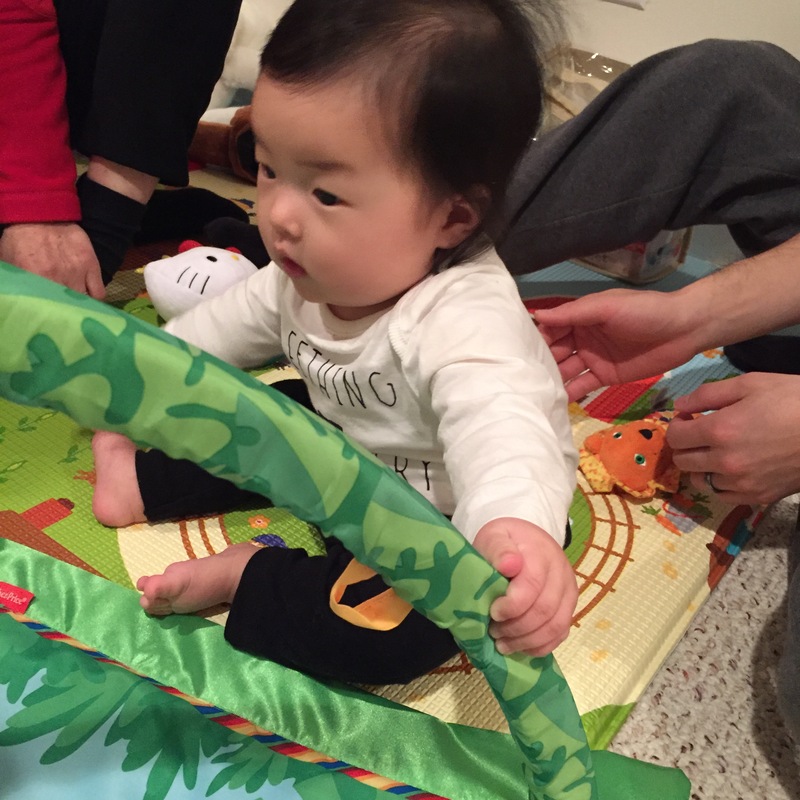 when she’s in a cooperative mood, she’ll also scrunch up her eyes when we say, “이쁜 눈”, or “pretty eyes.” as much as we can’t wait to see her crawling, it’s nice to have her immobile for the most part so we’re not busy chasing her around. we need to begin putting socket covers on the outlets because she’s getting more curious and touching those and the tv cable outlet. this is dennis’ long weekend – hurray! – and we plan on catching up on the walking dead. we only need to watch three more episodes and we’ll be all caught up (which is perfect since the season returns on 2/14). on sunday, we have a double date hangout with genie and ben.. without the babies!! we’ve been frantically thinking of what we could do but we couldn’t think of much except watch the superbowl (uninterested because the patriots are not in it), go to a paintbar, watch a movie, or go to the claypen (a pottery painting place). my injured arm really limits physical activities like bowling and dave & buster’s. 😦 either way, it’ll be nice to hang out with just adults. it’s a snow day today. schools are closed throughout the state and in massachusetts too. this winter has been incredibly mild compared to last year. this is the first snow day! it doesn’t really matter to me since i’m home anyway, but i love snow… how pure and clean it makes everything look. maybe i’ll take penny out in it so she can marvel at it and let her touch it as well. last saturday, dennis and i attended my cousin’s wedding in beverly, massachusetts. we were both nervous – me more so than dennis – on how penny would be at bedtime since she is accustomed to having one of us put her down for the night. since the wedding began at 4, we started getting ready around 12:30pm and left a little after 1:30pm in case there was traffic. and there was… but, gps navigated us and we got to the venue a half hour early. the annoying thing about being away from baby is having to pump on-the-go. i pumped on the way to the wedding, during the salad course, and on our way back home. we made it work though and penny ended up being fine. the only bump was that penny wouldn’t let mil rock her to sleep. so, mil put penny on her back and p fell asleep that way. father-daughter dance to “you are my sunshine.” i could not stop the tears.. there were quite a few people wiping their eyes. in my last post, i shared my concerns over my diet possibly upsetting penny’s stomach. i tried to cut out all dairy but i gave up after a day. there was barely anything i could eat in my home, and i can’t starve… i’m just guessing it’s a milk protein allergy because i can’t pinpoint anything else. it’d be fine if she pooped after every, or during, feeding but sometimes she poops 3 times after ONE feeding. she also has been getting blowouts more frequently particularly in the morning because she’s sleeping longer hours and she’s laying there in all that mess.. ugh. i feel so bad for her! she never had diaper rash until recently because of the constant pooping. my stomach has been feeling weird lately too so maybe we’re both being affected by dairy.. I. DON’T. KNOW. it’s just really frustrating. i may have to seriously cut out dairy depending how she does in the next few weeks. 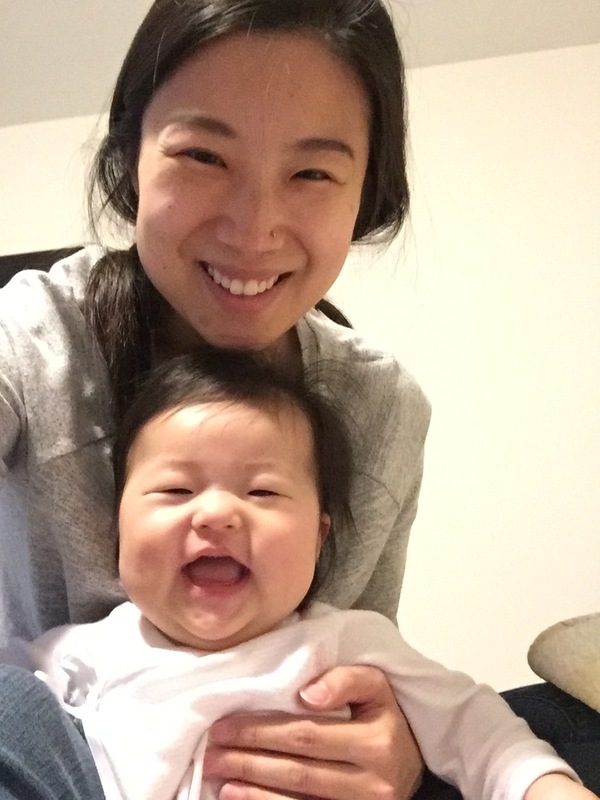 her 6-months check-up, and the next round of vaccines, is on monday so we can also update penny’s pediatrician then, too. now that penny is 6 months old, we resumed solids. i made a big batch of butternut squash and froze them in ice cube trays with a silicone cover. she’s still getting used to the texture as she’s used to liquids. i made a batch of sweet potato yesterday and made it more watery when i served it to her today; she seemed more receptive to that. this book was handed down to me from my cousin who has a 4-year-old son, mason. there are newer editions available. each cube is about 2 tablespoons which is a lot for a baby just starting solids. penny barely eats a teaspoon right now. it’s mostly just so baby can get used to different tastes and textures rather than filling them up. when i thaw each cube, i plan to divide it into two, maybe three servings and discard whatever she doesn’t eat. as she gets older she’ll consume a cube in one sitting but for now i’m trying not to waste food. after the cubes are frozen, i let the tray sit out for 5-10 minutes so the cubes are easier to remove and then put them in a baggie along with the date. i also had to go back and label the bag since the sweet potato batch is also orange. for some reason, the doorknob for the nursery squeaks a lot when turned. i tried all the other doorknobs in the house and, of course, hers is the loudest. the latch sometimes clicks loudly into place which has startled penny a few times, though not many, thank goodness. my sister made door jamb muffler (i had never heard of one!) after seeing them on pinterest but it was too loose. the idea is that the soft pillow part stretches tightly over the latch so when you close the door, there’s no clicking noise. i used leftover felt from penny’s baby groot costume and 2 hair ties to make one. as you can see the felt isn’t firm enough to push the latch in but it still does a nice job of muffling the latch. i’ll have to make a better one soon. 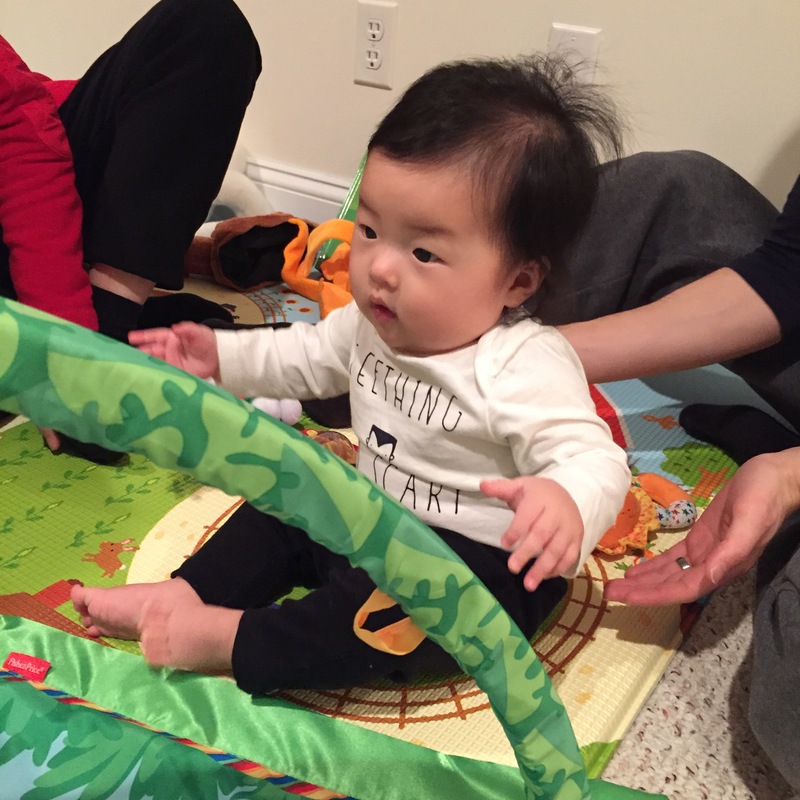 since five months, penny has been grabbing objects with both hands equally. she also LOVES to grab her feet and is constantly doing yoga poses while drinking from a bottle or when getting her diaper changed. now that she’s rolling over more frequently it’s so tough to change her diaper! she keeps wanting to go on her side -_- she has always been a wiggler so attempting to put her pants on is a challenge every time as one leg slides out of the pant leg while i’m hurriedly trying to insert the other leg in. she also began tilting her head to one size to scrutinize things more carefully; it’s so cute! one last thing we noticed is that she’s been making the “b” sound frequently (“ba-ba-ba”). she started by tucking in her bottom lip and then slowly began making the sound. she’s been moving around so much lately. she woke up from a nap recently but was playing so i left her alone for a bit while i finished eating. i look up and she had already turned 90 degrees. penny turned 6 months old yesterday. baby girl is already a half year old! i’ve reached the halfway point of my goal in providing exclusively breast milk to little p. for those of you that have been following my journey, you’ll recall my struggles with milk supply and latching among other issues. every day i thought, “my breastfeeding days could end today” but i kept trudging along. i made the little party hat using a 12 x 12 glitter scrapbook paper, felt number stickers, patterned scrapbook paper for the zig zag, and a fluffy pom from a decoration. penny also loves to grab her feet and feel different textures and fabrics. nowadays, supply isn’t the problem, the content of my milk is. since her newborn days, a red flush would briefly appear around p’s eyebrows whenever she nursed or drank from a bottle. i would wonder if she was reacting to something in my milk but would always dismiss it. she also sneezes throughout the day and frequently has watery eyes though both have improved in the past few months. i was reassured that both are normal, but i couldn’t shake the feeling that they were, again, allergic reactions. p’s poop count has also gone up. she used to have 1~2 bowel movements a day or every other day. during the past month, i’ve noticed that penny regularly has 3~4 poopy diapers. #4 caused me to call my pediatrician and i saved the diaper as well. when we went to the doctor’s office, we were told it could be a possible reaction to my diet. initially i thought it was coconut oil because i had started adding it to oatmeal to have more fat in my diet. 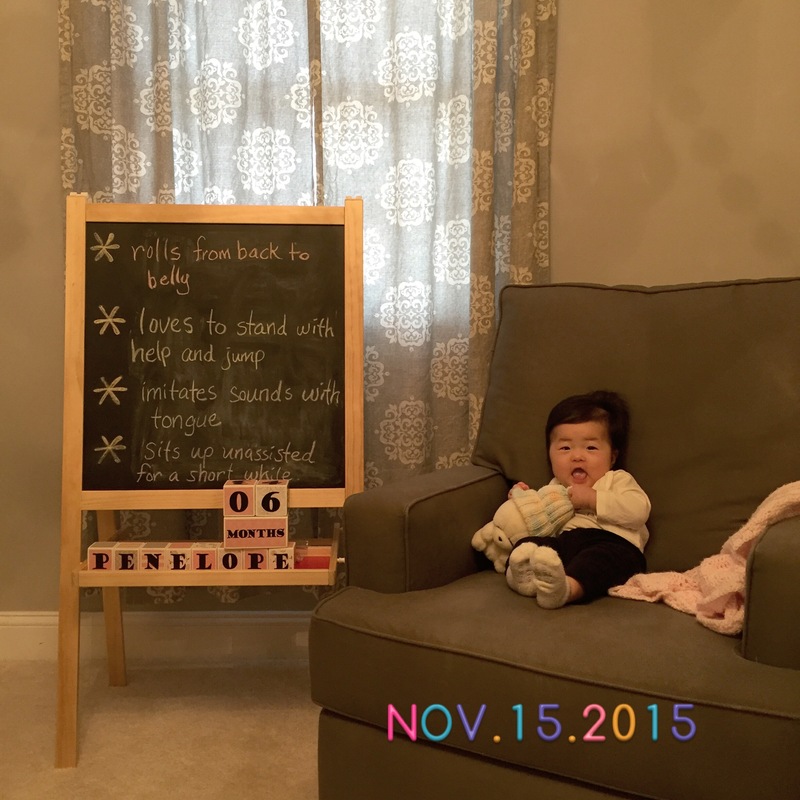 however when i referred to the baby tracker i saw that penny has been having multiple poopy diapers since september. i only started getting alarmed when it began happening more frequently. yesterday she had 6 poopy diapers!!! i really don’t think it’s normal.. and that milk is just passing right through her system without being digested. i’m constantly feeding her to replace what comes out but i don’t know if that aggravates the situation. she stops eating when she’s full and hasn’t surpassed 30oz a day. now i’m thinking it’s a milk protein allergy. i was on the fence about this, and still kind of am, because i thought i didn’t consume that many diary products. i don’t drink cow’s milk, i drink almond milk. i have butter and cheese occasionally but i do eat yogurt several times a week if not more. after much research and talking to a friend that had gone through the same problem, i discovered that dairy is in almost every single food. it’s incredibly difficult to avoid dairy because it’s hidden in a lot of food products. if you’re trying to eliminate dairy, it’s advised to avoid soy and whey as well. i don’t know if it’s connected but last night i had a snack of nutella on oatmeal bread before bed. hours later, as i rocked penny to sleep after nursing her she started pooping in my arms. after i changed her, she fell asleep but then she ended up having two more poopy diapers when she woke up! 3 bowel movements, and all before 8am. i looked at the ingredients for nutella and saw that it contains skim milk and whey. the oatmeal bread that i’ve been mindlessly eating contains soybean oil and whey. i thought i was being careful, but i wasn’t. what’s even more difficult is that it can take up to 3 weeks for milk protein to leave my body.. and then up to an additional 3 to exit penny’s. we’re talking 6 weeks maximum of poring over every ingredient in everything i eat. i’m already dreading thanksgiving because i won’t be able to eat mashed potatoes (my favorite), biscuits, mac & cheese.. and i’m too depressed to even think about what else. i had thought sticking to a mostly korean diet would help because dairy products aren’t often used, but soy is used often. i guess i’ll just have to ask my mil what’s in the foods she brings over and kindly ask her to omit soy.